When last we left our heroes, we’d just played a fey game, and since we weren’t dead or asleep for 1,000 years, we considered ourselves victors. 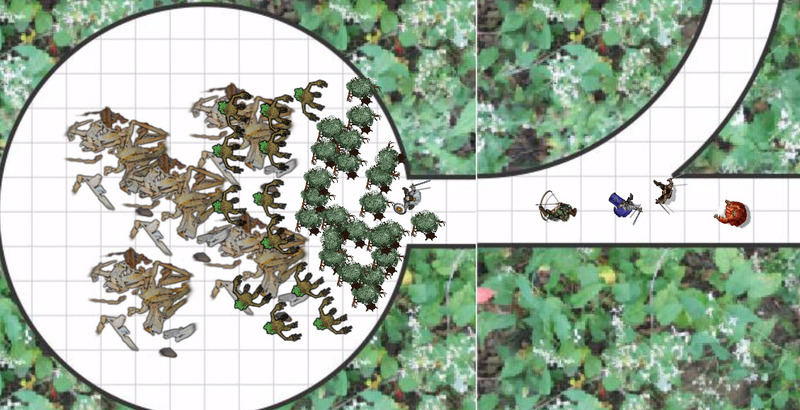 Journeying to the forest, and headed across a ridgeline, we discover 8 orcs (that we can see) trying to lay an ambush for us. They are about 120-140′ from us – ideal bow range for those of us with longbows. 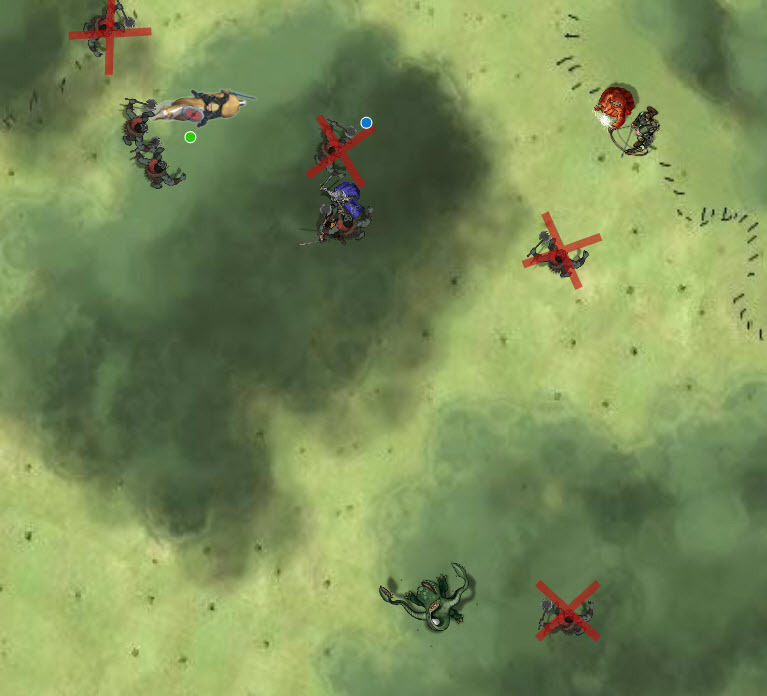 Marcus closes the distance and wastes two arrows firing ineffectually, while Carmina runs towards a group of orcs. The orcs themselves close the distance, one drawing an attack of opportunity (6 HP) from Marcus as he runs by, trying to get to the vile insulter, Colin McDaw. Orius lets fly with some magic missiles – Mr Orcy McAngrypants is the ony target in range, and hits for 14 HP total for three missiles. He’s magically dead. Keyar fells another, shooting and then falling back to gain the advantage of distance. Colin closes the distance, and uses his bonus action to Stealth. 22 HP later, Marcus kills another; these guys aren’t worth spending spell slots on. Carmina dashes forward trying to gain access to the fight (she’s got to move it move it). All of a sudden, a tentacle wraps around a downed orc, and drags him into the trees, much like the trash compactor scene in Star Wars. “Tentacles! Tentacles!” cries Orius. He casts Mage Armor on himself, always a wise move for a mage. The tentacled thing seems to have a taste for orcish meat, and eats another one. Because you can’t eat just one. 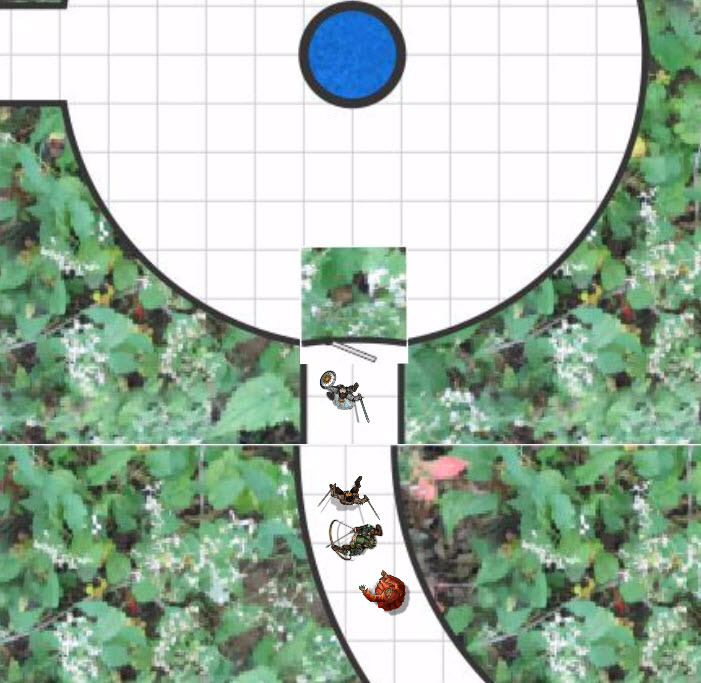 Colin chants: “There is trouble in the forest there is unrest among the trees.. for the maples want more sunlight, and the oaks ignore their pleas…” and engages another orc, staggering him but not killing him, while Marcus kills another with two solid blows. Carmina is finally in melee range, and delivers a warhammer to the face, which breaks open his face like a ripe melon. The tentacle creature comes rushing towards us . . . and the entire party feels ravenously hungry, as if standing next to a buffet. Some sort of telepathic communication. Orius makes an Arcana roll, and pegs it as an otyugh. He hits it with a fireball, and the hunger feelings turn to pain. Keyar pegs and kills the orc from a distance with one shot, and then goes after the Otyugh with Collossus Slayer, hitting for 18 HP. Vognur hits him with a thunderwave, and Marcus rides up and hits him twice (and expends a 2nd level spell slot) to hit for a total of 36 HP. Carmina hits it with Sacred Flame (WIS save or d8 radiant damage) for 2 HP. Looting the orcs we find 200d. Keyar takes the orc ears and wears them on a string. The way elves do? With much magical and bardic encouragement, the party follows the tracks back to the Otyugh’s lair . . . and there’s lots of stuff there. Stinky stuff, but stuff. Marcus hangs back (this is off mission), but doesn’t interfere (he’s Chaotic Good, not Chaotic Priss). They loot up 1,000d, 3 crowns, Silk Hunter’s Cap trimmed with Ermine (250d), Feathered Bracers (250d) Heward’s Handy Haversack, Potion of Clairvoyance. Any weapons in the stash are corroded. During conversation, we’re reminded we still have the Bag of Holding (holds 500 lbs). As we journey forth the next morning, a stag bursts out from the forest, his side is torn and rent, but between its antlers is a glowing blue orb of light. Out of the sky, a green dragon swoops down and lands on it, killing it. Avaria says “I am Avaria . . . who are the interlopers into my forest?! I am the queen of Dearthwood, and I forbid you to leave!” She flies off with the stag in her talons . . . and brambles begin to grow around us. Keyar shoots at the dragon, and misses. We find ourselves in a narrow path, and we proceed forward as we can – the sun is blotted out, there are no visible exits, and opposite from us is a corpse, impaled on the thorns. Maud says “We’re in the entrance, This is where Mori puts people she doesn’t like, but she wouldn’t put me here. There must be something wrong with Mori!” Avaria is Mori’s daughter. This can’t be good. The corpse is a woman, dressed in the tattered clothing of an Elder of Mitra. She is Elder Tara, a priestess known for adventuring in the Dearthwood. She’s carrying 225d, a Potion of Greater Healing, Scroll of Remove Curse. She was apparently last in her class in the Wisdom checks. As we check the wall of thorns, they lash out and hit Colin for 4 HP. Then a passage appears, and we decide to follow the opened piece. Not much we can do here but follow. And we come to a locked door, an actual wooden door, set into the bramble. Marcus asks Maud to ask the door to open . . . and it does. There’s a pool of water, glowing with a pale, sickly green light. The stag leaps out of the wall from the right, gash still wide open, and it runs, leaps over the pool, and runs down the corridor to the east. Keyar looks at the wall of thorns where the deer came out of, pokes it with a burning torch. It’s real. Four vines streak out, but only one bangs ineffectually off of Marcus’ shield (AC 24, baby). After that, nine plant creatures come forward, shambling out of the wall. 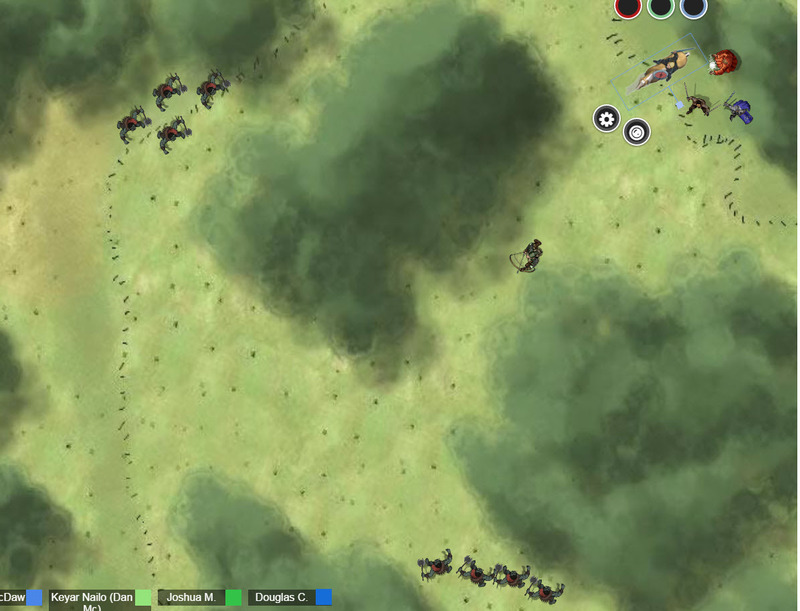 We start to shoot arrows and other ranged attacks at the critters, which die pretty easily. Some of the critter types we’ve not yet shot at shoot a spray of needles at Orius, and he casts Shield, causing the attacks to ricochet off his magical force field. Arcane Ward. Nice. We continue to make short work of these guys – they only take 10 or so HP to drop. Carmina fires Sacred Flame at green dot tree (the Holy Laser Pointer). Tentacles leap out of the pool, and miss Marcus, but hit Colin. It’s a spell (Thorn Whips), and when it hits Colin, it does 2 HP and drags him to the pool. Keyar kills the creature in front of him, and Colin runs to the final foe, and hits twice for 12 HP, dropping it. We hand Marcus a bludgeoning weapon, they cast a bunch of spells on me, and shatter the well wall. The sickly green glow goes away. We continue west, following the path of the stag as best we can. 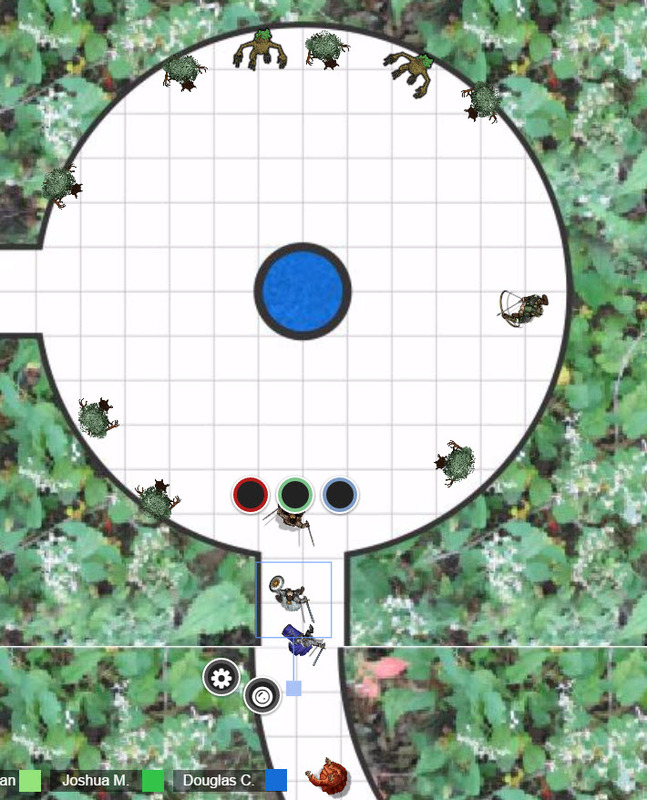 We come to another 60′ circular room, filled with stick men, and roll some truly terrible initiative. I mean, wow. We decide to pull back, and they dogpile Marcus. Most miss, but one critical hit hits for 18 HP. I suggest to +Tim Shorts to hit the entire group with a fireball, since they’ve obligingly all grouped up. I can almost certainly take the hit. Collin hits with Hail of Thorns, and can hit five creatures for 2d10 with a held action, and Marcus backs off to a safe place. Orius hits the center of the group with a fireball, and immolates them all at once. The fireball burns away the pile as well, neutralizing the room. With great power comes great flammability. We continue, but quickly realize we’ve been here before – we must have hit a teleporter. We detour back and head to a new room, this one with an old obelisk in it, with two skeletons dressed in mouldy armor on them. They have 468d in silver, and a +1 Shield. Orius can read the runes, too. They are perverted elven rituals, originally performed at the phases of the moon. There is no ritual for the full moon, but there is a blood sacrifice involved. There is but one face unmarked. The dragon Mori altered the sacrifice to include blood instead of fruit. Marcus senses this is profound evil. No surprise there. XP is awarded, and we get 1,320 XP. Nice. I’ve only got 7,475 to go. Heh. As we are about to leave, I realize that almost certainly Maud is the blood sacrifice required to complete the obelisk. Having said that out loud, I’m sure the GM now has options. Hell, I’d take that idea. What, points for Star Wars references, but no points for Rush? I'd file a grievance with the Adventurers Guild.